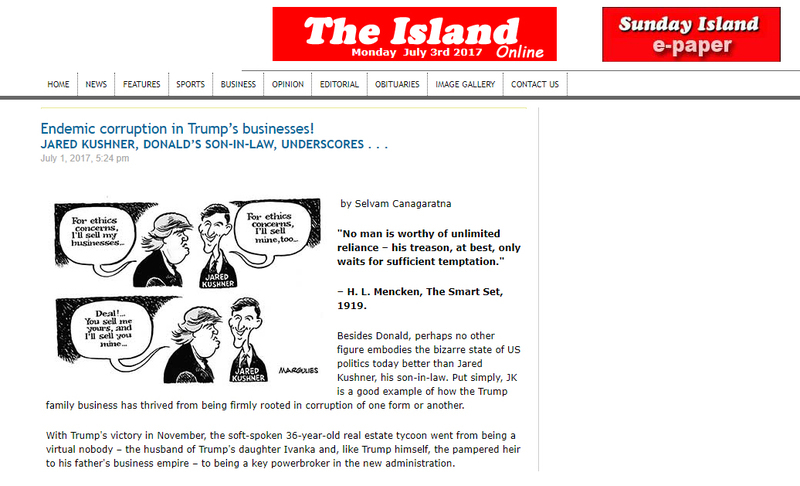 Endemic corruption in Trump’s businesses! JARED KUSHNER, DONALD’S SON-IN-LAW, UNDERSCORES . . .
"No man is worthy of unlimited reliance – his treason, at best, only waits for sufficient temptation." – H. L. Mencken, The Smart Set, 1919. Besides Donald, perhaps no other figure embodies the bizarre state of US politics today better than Jared Kushner, his son-in-law. Put simply, JK is a good example of how the Trump family business has thrived from being firmly rooted in corruption of one form or another.